This lovely Blakeney Summerhouse has recently been installed at a nursing home in Basingstoke to provide the residents with a sheltered, comfortable place that they can venture outside to and enjoy a bit of sunshine and the grounds of the nursing home. 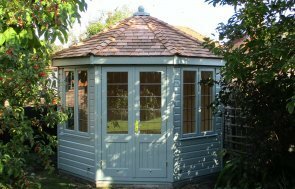 The Blakeney is a chalet style summerhouse with the roof overhang, the cladding is shiplap, painted using Sage from the Valtti Paint Range while the roof is lined in grey slate composite tiles. Inside the building, natural matchboard lining hides the insulation in the walls. 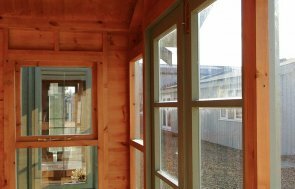 As well as the double doors, there are two opening windows on the summerhouse, one on either side, and there are six sets of windows in total, which will give a light, airy atmosphere inside, as well as giving the residents a good view of the garden from three different angles. Do you want a Summerhouse like this one? 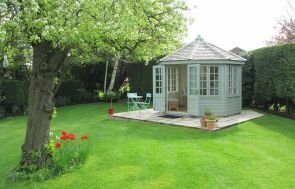 You can view the entire range of Garden Buildings here. Alternatively, we welcome visitors to our Seven UK Show Centres where we display a wide array of buildings for you to experience first hand. If you have any questions about this or any other of our garden buildings, please request a callback, contact us or call us on 01760 444229 where one of our friendly team will be on hand to provide answers and advice.